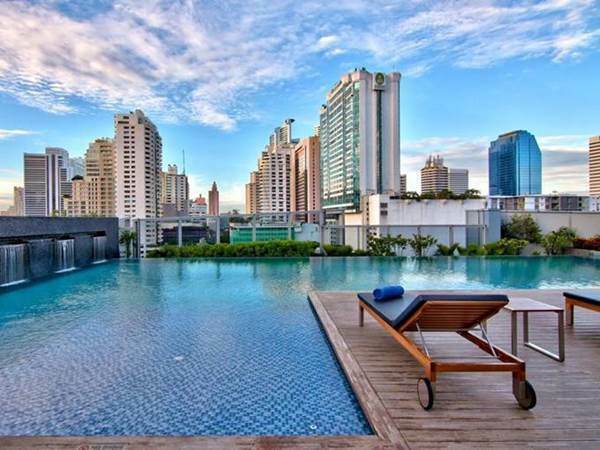 The Radisson Blu Plaza is a sophisticated hotel near Queen Sirikit Convention Center on Sukhumvit Road. From website: The hotel's location is ideal for your business trip. Stop by Terminal 21 and Emporium for great shopping or take a relaxing stroll through Benjasiri or Benjakitti Park, both located on Sukhumvit Road. The hotel's 290 spacious rooms offer such features as free wireless Internet access, large workstations and beautiful views of Bangkok. If you're looking for fine dining options, sample local, regional and international flavors at one of the six hotel restaurants and bars. Meeting space for up to 2,000 guests and a fully equipped business center are also available, making it easy to host professional hotel meetings in Bangkok.